As we head into week two of the Montana Legislature, we’re already knee deep in the hoopla. Last week we saw that the tone and tenor of this session (at least in the House) will be different than the last session. That’s good news for Montana’s hunters and anglers. The bad news is that we still have 130 bills that deal directly with your hunting opportunity, wildlife management and your ability to access public lands and waters. If you are one of the thousands of Montanans who view interaction with the Legislature as a tedious, time consuming chore that you have to engage in just to protect your current sporting opportunity, then god bless you. If you’re just getting involved, there are some ground rules that will help you be an effective advocate for wildlife and for hunters and anglers. 1.) Always be polite and courteous. You may strongly disagree with a bill and the motivations behind a legislator introducing it, but it’s important to remember what your momma taught you: It’s easier to catch flies with honey, not vinegar. 2.) Be direct, succinct and relevant. It may seem like common sense, but a lot of times when folks go to testify on a bill, they start to relate their world view rather than simply state that you are for or against a bill, and a few reasons why. Legislators have a lot to deal with, and while your points are surely the ones that will ensure passage or defeat of the bill, you have to remember that there is a line of other folks wanting to speak as well as a committee full of folks with questions about the bill. 4.) Get back to them! If you tell someone you will provide information, it is vital that you do so. Not just because your information will tip the scales in your favor, but because you gave your word to someone. That kind of follow through will set you apart from every other Johnny Testifier who talks a lot, but never delivers the goods. 5.) Be honest. It’s your word against the guys who you want to vanquish. If you tell a lie, you lose all credibility with Legislators. Honesty is always the best policy. This is probably the simplest tool you have, but can often be the most difficult one to wield. 6.) Bring your friends. Volume of testimony can affect the outcome of a bill. In 2011, 450 of our closest friends showed up to rally against HB 309, the Ditch Bill. 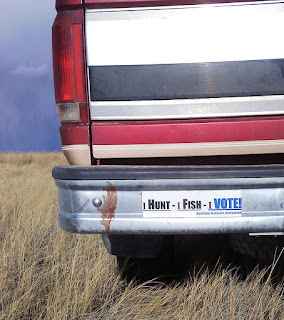 The bill was on a freight train to passing even with a ton of opposition by Montana’s hunters and anglers. Not until folks showed up in buses were we able to stop the bill in its tracks. You don’t have to rent a bus, but it is critical to bring a friend or three, or recruit your hunting buddies to write emails or make phone calls. 7.) Always use an elected officials title when addressing them. I don’t care if you think that person won their election on the back of a stolen mule. They have the right to be addressed with respect. Every committee chairman should always be addressed as Mr. Chairman, and every representative and senator needs to be given the respect that the office deserves. 8.) The Website is your friend. Leg.MT.Gov is the website that you will need to learn how to navigate during the session to find out when bills are coming up, what bills are introduced and what committee they are going to. You can keep track of what the House Fish, Wildlife and Parks Committee and the Senate Fish and Game Committee are up to by following the links. You can also contact legislators through the website and send emails to entire committees. We’ll cover more on this on another post this week. I’ve lobbied for 10 years; 8 sessions to be exact. There is no group of people more dedicated to the sound, scientific management of our wildlife and public lands than those of us with our hands in the gutpile. This session looks to be a little less contentious than the last one, but it will require all of us pulling together to ensure that our access, opportunity and the North American Model are kept whole. We’re just at the start of the 2013 Legislative session. Let’s make sure that we have a fruitful one.